When the fires of nuclear war were unleashed on October 23, 2077, the bombs changed more than just the landscape. The radiation produced new breeds of mutated animals, insects, plants and even people. One of the most common of these new forms of humanity are now known as ghouls. 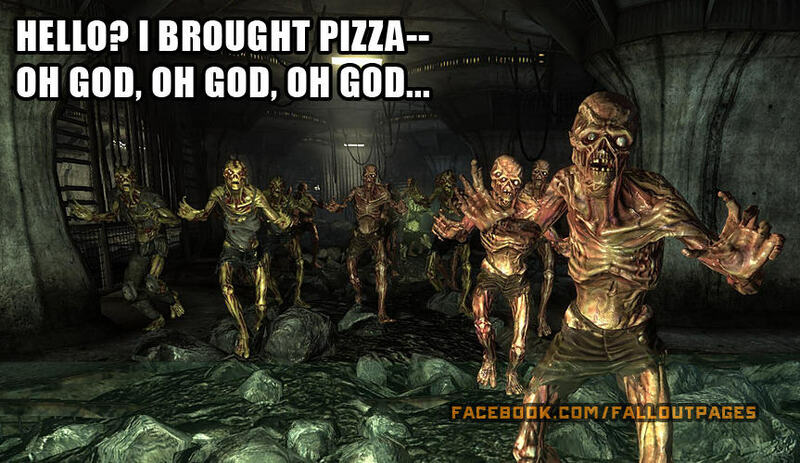 Fallout ghouls. Physically, ghouls look basically human, except for patches of charred, necrotic skin, sometimes peeled back in patches, revealing muscle and bone underneath. This makes them look ugly and terrifying to most humans, and is the cause of much prejudice and bigotry. Ghouls are rarely welcome among human communities, and words like “zombie,” and “brain eater” are common insults directed at ghouls. Ghouls are found throughout post-nuclear America, but it is thought most originated as a result of one of Vault-Tec's many depraved experiments. Vault 12, located near the city of Bakersfield in the region once known as California, was designed to malfunction. The great steel door that protected every Vault-Tec vault was deliberately faulty. Instead of protecting the inhabitants from the radiation and fallout, the vault allowed dangerous levels of radiation to contaminate them. Most of the victims died as a result, but a few survived, mutated and became ghouls. The transformation did not happen immediately, however. Radiation kills slowly, and the survivors were forced to watch as their fellow vault dwellers gradually succumbed to its effects while their own bodies became wasted and necrotic. Though weakened by radiation sickness, they did not die, and eventually escaped Vault 12 to find a harsh and unforgiving world outside (Vault City). These were not the only ghouls born in the holocaust, and they would not be the last. The precise conditions that result in ghoulification are the subject of much debate. Some believe it's caused by exposure to high levels of gamma radiation; others argue that infection with the FEV that also created the super mutants is a key component. Whatever the cause, ghouls have become a permanent part of the post-war world. So, what are they? Biologically, ghouls are essentially human, but with many differences on the cellular level. Though physically weaker due to their damaged tissues, they live considerably longer than humans. Many of the ghouls created in the Great War of 2077 are still alive in 2281. This is due to mutation that actually disrupts the normal process of decay in spinal neurotransmitters. As a result of this and other mutations, low-level ionizing radiation actually speeds healing in ghouls. Because of this, some make their homes near locations with higher than normal radiation levels. High levels of gamma radiation are still dangerous even for ghouls, however, speeding the decay process. Though many humans survive the ghoulification process with their mental faculties intact, most do not. Those whose minds break under the stress become feral, humanoid creatures of little more than animal intelligence. These pitiful creatures often are found in the sewers and metro tunnels of ruined cities or wandering the wasteland in packs searching for fresh meat or toxic waste. 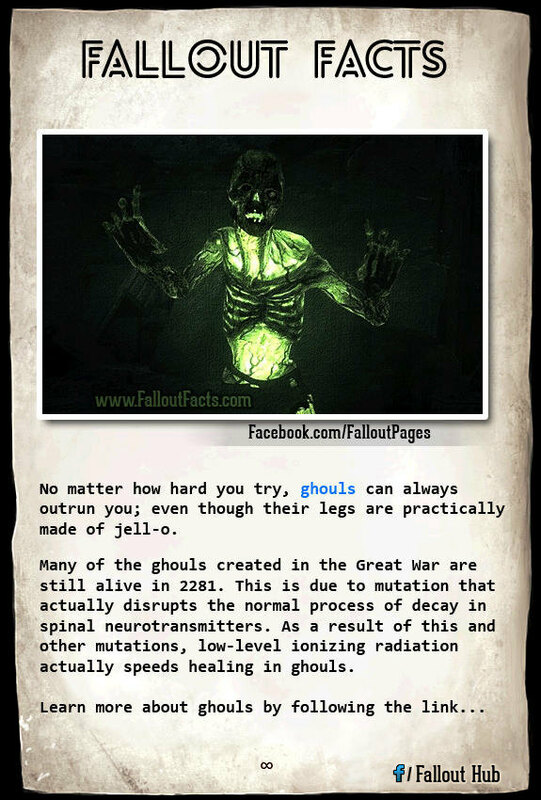 Some ghouls, particularly feral ghouls, are exposed to so much radiation that they become living conduits for it. These “glowing ones” are able to store radiation in their tissues, releasing it in catastrophic waves, hazardous to us humans. Wastelanders would be well advised to avoid these creatures. And that's all we've got on Fallout How Ghouls are Made. That's enough for today, wastelanders; stay tuned for more Fallout Facts. Did you find this article interesting? Share it!